Divorce rates in the U.S. are decreasing since reaching a peak in the 1980’s. However, in the Muslim community, rates are on the rise. Community leaders across the country have expressed concern about marital discord and divorce rates in the American Muslim community. There is limited research on this issue and little in the way of resources for practitioners, religious leaders, and members of the community offering support to families facing challenging times. 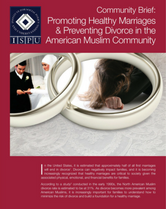 To help address the need and improve marriage outcomes in the American Muslim community, ISPU is embarking on an ambitious exploratory study. 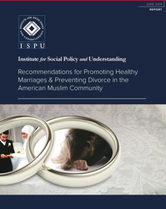 ISPU’s study on promoting healthy marriages and preventing divorce provides an understanding of the ways in which American Muslims perceive and utilize marriage education and marital interventions. Researchers conducted individual interviews with imams, counselors, divorcees and married individuals to determine the use of and feasibility of marriage education and marital interventions in the American Muslim community. ISPU Executive Director Shireen Zaman introduces the project. 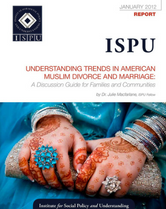 ISPU Legal Fellow Julie Macfarlane shares her research on North American Muslim marriage and divorce. ISPU COO and Director of Policy Impact Farhan Latif reveals ISPU survey results on marriage and divorce. Eyaad Odeh and Noor Ali share their story of how they overcame marriage difficulties. The Muslim Unity Center Trustee Dr. Mahmoud Al-Hadidi gives a ringing endorsement of the project and ISPU. Hamada Hamid is the Director for the Center for Global Health at ISPU. He is also a Clinical Instructor in the Departments of Neurology and Psychiatry at Yale University. Dr. Julie Macfarlane is Professor at the Faculty of Law of the University of Windsor. Julie has researched and written extensively on dispute resolution and in particular the role of lawyers. Macfarlane recently completed a four-year empirical research project examining the use of Islamic family law principles and values in divorce processes conducted by third parties in North American mosques. Her new book, Islamic Divorce in North America: A Shari’a Path in a Secular Society, is published by Oxford University Press. Munira Ezzeldine is the author of “Before the Wedding:Questions for Muslims to Ask Before Getting Married.” She received her master’s in counseling at California State University, Fullerton, and her bachelor’s from UCLA. She is a trained Prepare/Enrich facilitator and provides pre-marital counseling services to Muslim couples. She has written prolifically for Muslim publications and websites on the topics of marriage and family. Dr. Sameera Ahmed is the Director of the Family & Youth Institute and a Clinical Assistant Professor at Wayne State University. Sameera has researched, written, and presented extensively on issues facing emerging Muslim adults. Altaf Husain serves as an Assistant Professor in the Howard University School of Social Work, in Washington DC. Dr. Husain’s research interests include displaced populations (homelessness, victims of disaster, immigrants and refugees), mental health and psychosocial well-being of adolescent immigrants and refugees of color in the U.S.; immigration policy and its impact on the family; cultural competence; and the development of social service agencies in the Muslim community. For over a decade, he has delivered workshops and lectures on a range of topics related to establishing and sustaining healthy marriages. Asifa Quraishi-Landes is a fellow at ISPU and an Assistant Professor of Law at University of Wisconsin Law School. She specializes in comparative Islamic and U.S.constitutional law. She was awarded a 2012 Guggenheim Fellowship for her work on Islamic constitutionalism for the 21st century. Salma Elkadi Abugideiri is a licensed professional counselor in private practice in northern Virginia. She has worked extensively with refugees, immigrants, and Muslim & Middle Eastern families. Ms. Abugideiri has authored several publications on the issue of domestic violence in Muslim communities including a chapter in Counseling Muslims: Handbook of Mental Health Issues & Interventions. She has also co-authored a brief guide for helping professionals entitled What Islam Says About Domestic Violence. She provides training and consultation in the areas of mental health and domestic violence in Muslim communities. She has also presented at numerous national and international conferences. She is a founding Board Member of the Peaceful Families Project, a national non-profit organization dedicated to ending domestic violence in Muslim communities. Zarinah Nadir, Esq. is an attorney licensed in the State of Arizona and Federal court. Her areas of the law include family law and juvenile justice. A community activist and co-founder of Al-Mu’minah Muslim Women’s Association Ms. Nadir, who is also a board member of the Islamic Social Services Association-USA (ISSA-USA), focuses on making legal access affordable to the masses and legal concerns facing women, youth, and families. Her primary research interests include the enforceability of Islamic family law and inheritance rights in the American court system. Dr. Aneesah Nadir has been a social worker for more 30 years. After 17 years she retired from teaching social work at Arizona State University. Dr. Nadir is also a diversity trainer and a marriage and family life educator. She serves as the President of the Islamic Social Services Association-USA and as the Program Manager for ISSA-USA’s Sakinah Healthy Marriage Initiative and National Muslim Marriage Week. Her research areas include social work with American Muslims, youth and families. Her practice areas include premarital education and spiritually based marriage counseling. Currently she focuses on the intersection between social work and the law as well as the value of affordable legal access for families. Jane Forman, ScD MHS, is the Director of the Qualitative/Mixed Methods Core at the VA Ann Arbor HSR&D Center for Clinical Management Research (CCMR). She collaborates with and mentors investigators in the design, data collection, and analysis phases of studies that include qualitative and mixed methods, with an emphasis on understanding health care delivery systems, translating health services research into practice, and evaluation. These studies include identifying factors that facilitate and impede the adoption of evidence-based infection prevention practices in hospitals and evaluating a peer outreach program that facilitates mental health treatment connection and retention among Michigan National Guard soldiers following their return from Operation Iraqi Freedom (OIF) and Operation Enduring Freedom (OEF). She currently leads the qualitative component of the evaluation of the VA Ann Arbor Healthcare System Patient-Aligned Care Team (PACT) Demonstration Laboratory, which includes collaboration with primary care leaders charged with implementing redesign of primary care delivery. Dr. Forman teaches qualitative research methods as core faculty in the Robert Wood Johnson Clinical Scholars Program at the University of Michigan Medical School. She earned her ScD from the Program in Law, Ethics, and Health (2001) and an MHS in Health Finance and Management (1991), both at the Johns Hopkins Bloomberg School of Public Health.